Do you deserve a reward for being responsible? If you are paying your credit card’s balance in full every month, the credit card market is set up to offer you valuable rewards for your spending. All you have to do is choose one of the many reward credit cards. And just like savvy savers choose the best investments based on their rate of return, smart rewards card users will choose the credit cards that offer the best returns for their spending. So how do you find the best reward card? There is no single best card for everyone, rather credit card users need to find the card that will return the best rewards possible for the kind of spending they do. Value per dollar spent. Over the long term, the most important thing about a rewards card will be how much value it returns for each dollar spent. For example, cash-back reward cards simply return a percentage of spending, while other products offer airline miles, hotel points, or other rewards. Then, it is up to the cardholder to place a value on those rewards in order to determine the value received for each dollar spent. In general, anything more than 2 cents per dollar is considered excellent, 1 to 2 cents is acceptable, and less than 1 cent is poor. Sign-up bonus. Another feature common to many reward credit cards is the sign-up bonus. Banks offer new applicants a lump sum of rewards, usually after reaching a minimum spending requirement. In fact, there has been somewhat of a race between banks to offer the most attractive rewards, with some products featuring bonuses in the form of points or miles worth $1,000 or more. Perks and benefits. Beyond points, miles, and cash back, many reward cards feature such things as travel insurance and purchase protection policies. Rewards credit cards co-branded with airlines and hotels can also offer impressive benefits when traveling, so don’t discount the value of these types of rewards. New applicants should ensure that any fees paid are justified based on the value of the rewards. What is almost never justified is the higher interest rates normally present on reward cards. Those who carry a balance should always be using a card with the lowest interest rate available, not a rewards card. Citi and American Airlines offer this co-branded rewards card that features airline miles plus plenty of other travel benefits. New cardholders earn 30,000 miles after spending just $1,000 within the first three months of opening their account, as well as earning one mile per dollar spent. Double miles are earned for purchases from American Airlines. Cardholders also receive priority boarding, a 25% discount on in-flight purchases, and their first bag checked for free. There is a $95 annual fee for this card that is waived the first year. This rewards card is like a Swiss Army Knife for travelers. Cardholders earn two points per dollar spent at restaurants and on travel expenses, and one point per dollar everywhere else. A third point is earned for travel booked through Chase’s Ultimate Rewards site. Once earned, Chase’s Ultimate Rewards points can be transferred to any of eight different airline and hotel programs, or to Amtrak Guest Rewards. Alternatively, points are worth 1.25 cents each when redeemed for travel booked through Chase’s site. The current sign-up bonus if 40,000 points after spending $3,000 within the first three months of opening an account. There is a $95 annual fee for this card that is waived the first year, and there are no foreign transaction fees. Capital One offers this entry-level rewards card that earns 1.25 of their miles per dollar spent on all purchases. Each of their miles is worth one cent as a statement credit towards any travel purchase. There is no annual fee for this card and no foreign transaction fees. Capital One also offers its Venture Rewards card that features double miles on all purchases. At publishing time, Citi Platinum Select AAdvantage Visa Signature Card, Chase Sapphire Preferred and Capital One VentureOne Rewards are offered through Credit.com product pages and Credit.com is compensated if our users apply for and ultimately sign up for any of these cards. However, this relationship does not result in any preferential editorial treatment. 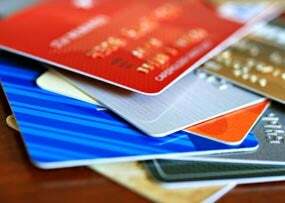 Jason Steele has been writing about credit cards and personal finance since 2008, poring through the terms and conditions of credit card agreements to understand the minutiae of how these products work. His work has appeared on Yahoo, MSN, HuffingtonPost and other major news outlets. In his free time, Jason's a commercial pilot. He graduated from the University of Delaware with a degree in History. Wow, you have got to be kidding! I cannot believe you have the email address ‘credit experts’ – you have missed the mark with your report by SO much that I can’t believe someone posted your ‘article’ as ‘information’. More like dis-information. The one factual thing you stated is “Over the long term, the most important thing about a rewards card will be how much value it returns for each dollar spent.” But then you failed to list the cards with the most value. You may be experts in other credit areas, but rewards credit cards isn’t one of them. First – there is one card that is vastly superior to any/all you named if you make frequent airline trips. If you don’t fly much, this is not the card for you. But the value of US Bank FlexPerks greatly exceeds all cards you listed. And, no, I don’t work for US Bank. I’m retired and I spend much of my time researching ‘the best’. Why FlexPerks? You get more than 1 point per dollar spent. You only get 1-1, but there are automatic double points for cell phone, tasting room purchases, and double for the highest of gas, groceries, airfare. Also, automatic triple points for charity donations. And each point is worth very close to 2 cents. So, the value is greater than 2 cents per dollar spent since you get more than 1 point per dollar. Currently it is actually greater than 3 cents per dollar spent, since you get 1/2 extra bonus point per dollar per month with US Bank Platinum checking, but that goes away August 10, 2013. I’m VERY disappointed at this development, but they realized they were providing too good of a deal. Well over 3 cents per dollar spent could not be sustained. How is the value ‘close’ to 2 cents per point? 20,000 points buys an airline ticket for up to $400 on 150 airlines. Plus, $25 credit is allowed to be spent on bags, food, etc. with the airline when traveling. Plus you earn the miles you fly – it is just like you bought a ticket with cash. And the multiple keeps working – 30K points for a ticket up to $600, 100K up to $2000 and so on. Since I acquired the card, I have redeemed 40K for a $796 ticket; 20K x 2 for $383 ticket and 30K for $586 ticket. Not quite 2 cents per point, but close. And, with more than 1 point per dollar, you are getting over 2 cents in value for each dollar spent on your credit card. Note the $383 tickets are SFO-NY-PHX flying (SFO-NY) the Fri before Thanksgiving and (NY-PHX) the Wed before Thanksgiving (United). I could have used 100K (50K each) United miles for those flights (double points for peak flying), or 40K FlexPerks points. Using your Starwood (25% bonus) “feature” I would have to spend $80K for the same flights free. And I wouldn’t get $25 credit and I wouldn’t get credit for the miles flown. HUGE difference. Since you get nearly 2 cents per point and more than 1 points per dollar, you get more than 2 cents per dollar spent. And you didn’t even mention this US Bank card. NO card you mentioned is providing more than 2 cents per dollar spent. Another card that I have has no annual fee and provides value that is more than 2 cents per dollar spent – Virgin America (around 2.2 cents). But, if you don’t fly Virgin America, this card has no utility for you. But, what really made me write this email is HOW FAR OFF YOU ARE ON AMERICAN EXPRESS HILTON SURPASS!!!!!! That card is horrible compared to the Citi Hilton card (imho) and you didn’t mention Citi, mainly because you get Gold status just for having the card vs. Amex’s silver. I canceled Amex and got Citi 10 weeks ago. But then a few days later Hilton announced an upcoming change to their reward structure, so I doubt that I will renew Citi when it comes up next year. Both Amex and Citi cards are horrible because Hilton is now horrible, from a ‘value the customer’ standpoint. But, with Citi you get free breakfast whenever you stay at Hilton because you are ‘lifetime’ Gold status when you have the Citi Hilton card. I am currently Hilton Diamond due to my spending on Amex last year, but I will no longer be diamond in 2014, because Gold gets you roughly the same benefits as Diamond. So direct your spending elsewhere – it isn’t worth it to spend $40K on the card to get Diamond status. But, why is Hilton so bad? Because, on March 28, 2013, their point structure changed. HUGE. They went from Hotel categories 1-7 to 1-10. Times Square Garden Inn went from Category 6 to 9. By the end of this year, I will have stayed in this property 3 times at 30K to 40K points per night. To show how bad they shafted the customers, a 9 night stay (extreme example) is 270K (9 x 40K less 25%) points in the old system. The new system is 640K points for the same 9 nights (8 x 80K with 1 free night). This is a 2.37 times increase (or devaluation of points depending on how you want to look at it). Hilton is doing away with their VIP discount (15-20-25% off for stays of 4, 5, 6 or more nights) and charging double the points per night for this property. So, when you said ‘up to 50K points for Hilton’s luxurious hotels’ you were off. A LOT. Make that almost double. 95K per night. The Times Square Garden Inn is hardly one of their upscale properties and it is 80K in June and November, when we are staying this year (using old points, since we booked March 27th). Anyway, when I saw your article I decided I would read it and see what I could learn. Sorry, but you are not experts. You need to get out more. Rebuttal welcome (and sought). I’m here to learn. I spend much of my time trying to maximize credit card rewards. I am sure you do too. But, the gap between my understanding and your presentation is large. In closing, to be fair, neither of the rewards cards that I claim to have greater value than what you present are worth much if you aren’t flying. The cards you highlighted may be preferable for every day use if you fly infrequently. Thanks for your comment, as we definitely like to spark a healthy debate with these articles. Here are a few thoughts: I tried to offer a few examples of valuable reward cards, rather than a “best of”. I reserve those for our Best Credit Cards in America series. Sorry for the confusion. Nevertheless, I stand by the value of the three cards mentioned in this article as I happen to have personal experience with them. No one ever said choosing a rewards card is easy, but I have been researching and writing about this topic since 2007, and I always enjoy hearing new opinions on this subject.